In this review, we’ll be taking a look at the Orion 9827 Astroview 6 Equatorial Reflector Telescope. This piece of equipment is great for those just starting out with dreams to become serious astronomers. This telescope is equipped with several adjustable pieces to give you the clearest view of the night sky possible, as well as Starry Night Orion astronomy software to help you plot the location of different constellations and help you control your telescope. For a more detailed review of this product, keep reading as we explore some of its unique features and specifications. First, we’ll talk about some of the physical specifications of the Orion. At six feet long and 37.1 lbs, it’s a hefty telescope that will give newcomers a real sense of being an astronomer. Its aperture can adjust between 150mm to 200mm depending on your needs, with a 750mm focal length. As mentioned before, it comes with a copy of Starry Night Orion software, which you can use to look at a simulation of the sky from anywhere on the planet and control the adjustments made to your telescope. Satisfied buyers talk about the sturdiness of the included tripod, though also mention that it typically takes about double the time listed in the manual to assemble (about 1 hour) and is easily shaken. However, users also report being able to see as far as Jupiter and beyond using the Orion, making it a good scope for those just getting into stargazing. There are many advantages and disadvantages to using the Orion, such as its impressively long view but susceptibility to shaking with minimal movement. For convenience, we’ve listed them all here. Two Sirius Plossl 1.25″ telescope eyepieces for 30x and 75x magnification included. 6×30 finderscope to help in finding stellar bodies. Includes Starry Night Orion program to create realistic maps of the night sky and control your telescope. Sturdy, maneuverable tripod allows you to track movement in the sky. Range is far enough to clearly see the planet Saturn. Tripod is susceptible to shaking. Calibrating the finder scope can take time. Elevation bolt is tight and difficult to adjust. RA and DEC indicators are hard to read and not useful. You can find the Orion 9827 Astroview 6 equatorial reflector telescope online. Most large online vendors like Amazon or eBay have this Orion telescope model. Prices vary, depending on the seller. The Orion 9827 Astroview 6 equatorial reflector telescope is a mid-priced telescope. The package usually includes all the accessories you could need, so you don’t have to make extra investments to take full advantage of the Orion 9827 Astroview 6 telescope. Overall, customers seem very satisfied with the Orion 9827 Astroview 6 Equatorial Reflector Telescope with none below three stars and the majority on every site being made up of five stars. Reviews constantly emphasize how clear a view they can see through the lens, even in areas with high light pollution, as well as how easy it is to assemble if you follow the instructions. Planets as far out as Jupiter and Saturn are visible if they are in the right position in the sky. Closer to home, the Orion gives an exceptionally detailed view of our planet’s moon. The Orion can be fully disassembled when not in use, making cleaning and storage incredibly easy. A free lens cover is available to help protect the sensitive technology that makes your telescope work. Aside from this, though, no specific maintenance requirements are listed from sellers. A one-year limited manufacturer’s warranty is offered when you buy the Orion 9827 Astroview 6 Equatorial Reflector Telescope. For complete details, contact your seller. When buying from Amazon.com, specifically, you will need to contact customer service in order to activate your warranty. The Orion 9827 Astroview 6 Equatorial Reflector Telescope is a fantastic telescope for beginner and intermediate stargazers. For the price, it offers an incredibly clear view of distant planets outside the asteroid belt, as well as detailed looks as closer celestial bodies like the moon. Its many adjustment settings help you get the view you want, and the Starry Night Orion software helps you plan when and where to view the sky. 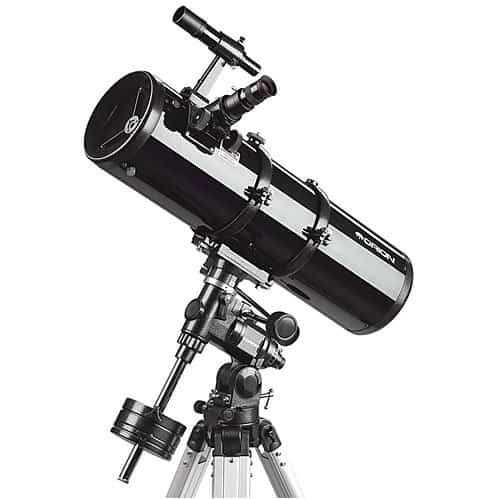 It is overall one of the best telescopes available. Do you have anything to add to our Orion 9827 Astroview 6 Equatorial Reflector Telescope review? Share your thoughts and questions with us.